In a time when everyone is cutting their budgets, I’m so happy to get to announce that the Amgen Corporation continues to support great science teachers with their generous award of $10,000. The Amgen Award for Science Teaching Excellence honors innovative teachers who are making a difference in science education. It has been my honor to participate in the Colorado awards presentation and I also served on the panel of judges several years back. The award is just as it reads… $5,000 for you and $5,000 for your school. Applicants must work in communities in which Amgen has key operating sites including California, Colorado, Kentucky, Massachusetts, Puerto Rico, Rhode Island, Washington and Canada (Alberta, British Columbia, Ontario and Quebec). Amgen, a biotechnology pioneer, discovers, develops, manufactures and markets important human therapeutics for serious illnesses. Amgen is committed to dramatically improving people’s lives – not only through the therapeutics we deliver to patients but also through supporting programs that advance science literacy throughout North America. Since the program’s inception in 1992, Amgen has awarded nearly $2.5 million to public and private school science teachers, grades K-12, in communities in which Amgen operates. Following an extensive judging process, 34 science teachers will be chosen for the award. The selected winners from California, Colorado, Kentucky, Massachusetts, Puerto Rico, Rhode Island, Washington and Canada (Alberta, British Columbia, Ontario and Quebec) will receive an unrestricted cash award of $5,000 USD or $5,000 CAD and the recipient’s school will receive a restricted grant of $5,000 USD or $5,000 CAD to be utilized for the expansion or enhancement of a school science program, for science resources, or for the professional development of the school’s science teachers. Applicants for this award must be full-time classroom teachers of grades K–12 in a public or private school setting and whose major responsibilities include teaching science. Additionally, applicants must serve one single school facility. Applicants must be teaching full time at time of application submission and throughout the following academic year. Applicants must have at least three years of experience teaching science in grades K–12. Applicants must work in communities in which Amgen has key operating sites: California, Colorado, Kentucky, Massachusetts, Puerto Rico, Rhode Island, Washington and Canada (Alberta, British Columbia, Ontario and Quebec). Immediate-family members of Amgen staff are not eligible to receive this award. Teachers who are past winners of the Amgen Award for Science Teaching Excellence are not eligible. 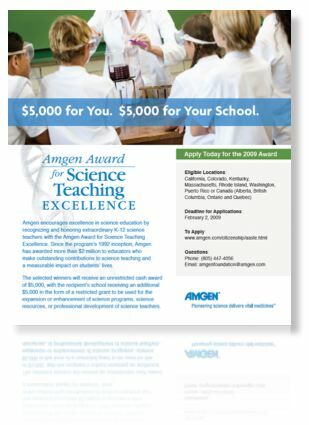 Schools that are past recipients of the Amgen Award for Science Teaching Excellence are not eligible in consecutive years.